I hike/mountain bike at the Swope Park trails all the time, rather safe. But an ideal place for anyone looking to commit any such crimes - I hope this trend doesn't copycat down there. Too much coincidence at this point. All white males near/in parks/trails. Yep. And now the FBI has been called in. I think it's significant that they haven't released a cause of death for the victims, at least officially. There are details they don't want the public to know. Or don't want the killer(s) to know they know. 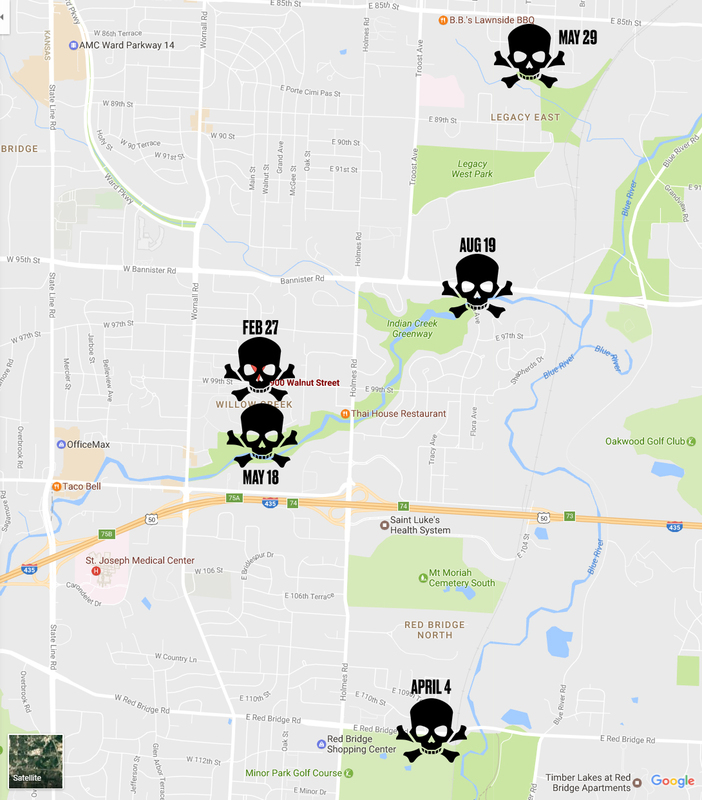 Last edited by luzianne; 05-31-2017 at 07:33 PM..
Kansas City has a serial killer on its hands. These are just the ones that have a discernable pattern or haven't been linked (yet) by DNA evidence. 330mil people in the US, even if it's 1 in a 100,000 then we have 3,300 of them. I don't think the numbers are that high, but according to some FBI statistics there are typically 25-50 active serial killers at one time. Another death in a park this week. Woman found shot in her car. 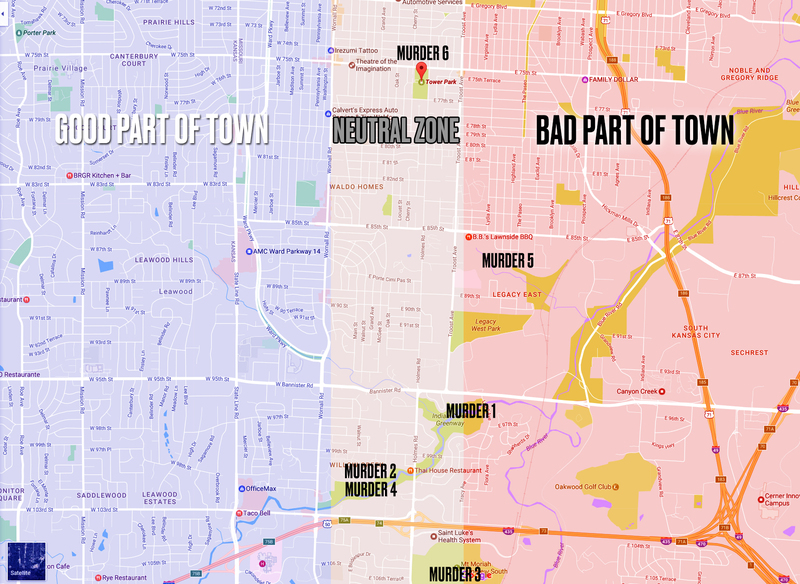 It's in the same "zone" as the other murders...where you're not quite knee-deep in crime, but getting close. I wouldn't be surprised if it's the same guy. Sadly, I don't think I would be too surprised at all to hear this "guy" called a serial killer and not because of the number of victims he will claim but I've lived in KC, Independence and only those areas all of my 45+ years and things have just gotten so bad in recent years...nothing feels safe near the KC area. I hope they solve this one soon so everyone can rest a little easier. It doesn't seem like these are related to high crime areas. These are bizarre killings of random people. This could be happening anywhere in metro KC. If it's a serial killer, I wouldn't be surprised if a similar murder happens in complete different part of the metro. I am so sick of all the crime in places that used to be considered safe. As a woman, I've already felt restricted in trails and parks where I can hike/go for walks alone and at what time of day I can go there. Now, even previously safe-seeming trails seem off-limits. I've bicycled the Indian Creek Trail many times, usually with my husband but sometimes alone. No interest in going there any longer. I also think the police are deliberately withholding info for strategic reasons. But I found it odd that they have insisted that these trails are safe. Clearly they aren't for everyone.